Beer Can Chicken has been around for a while and is still very popular – the reason being it’s a fantastic way to prepare the humble bird or it’s relation the cornish game hen. We use game hens when we cook for two. The method is the same with only a few tweaks. The most obvious one being the size of the can that the bird ‘sits’ on. A normal beer or soda can is perfect for most chickens, but we found a smaller can such as an energy drink or cold coffee drink can works well with the smaller game hens. Preheat oven to 350° or prepare grill with lid to 350°. If using an oven, move the rack low enough to accommodate the upright (and Outtasite) bird on the can. Drain the liquid from the can and rinse. Fill the can only halfway with water, beer, or soda. The flavor of the liquid is pretty much indiscernible after cooking. Place the can on a small sheet pan. Dry the hen inside and out with paper towels and tuck the wingtips behind the back. Rub oil on the outside and season with herbs and spices. 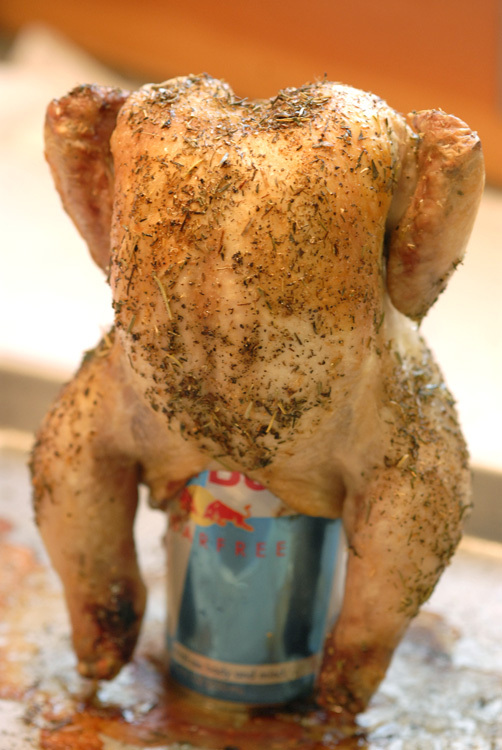 Carefully mount the bird on top of the half filled can. For the oven, keep the bird on the sheet pan to cook. 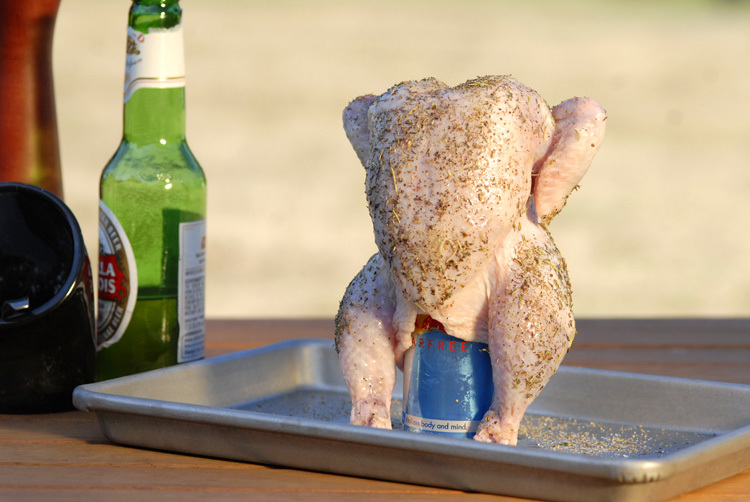 For the grill, place the hen with the can directly on the BBQ grill and cover with a lid. Roast or grill for approximately 45 minutes or until the internal temperature reaches 165°. This entry was posted in entree, recipes and tagged american, barbeque, BBQ, chicken, cooking, dinner, dish, easy, entree, food, grill, healthy, main, outdoors, oven, party, poultry, recipe, simple by MixedSoup. Bookmark the permalink.